Alternative capital is clearly a permanent feature of the global reinsurance market and will continue to increase its share of the global property catastrophe limit, but its growth in the space should no longer be termed as exponential, says JLT Re. Reinsurance broker JLT Re has said that while the inflow of alternative reinsurance capital will continue, and that its presence in the global re/insurance marketplace is here to stay, market dynamics and recent trends suggest its growth in the property catastrophe space is likely to continue to moderate. “The increased maturity and discipline is indicative of stable institutional money that has made a long-term commitment to the market. So whilst third-party capital is now undoubtedly a permanent feature of the reinsurance market, particularly in the property-catastrophe segment, its entry into the sector can no-longer be described as exponential or even straight-line,” said JLT Re. Owing to ease of entry and advanced modeling capabilities, when compared to other business lines, the majority of third-party reinsurance capital has focused on the property catastrophe space. As a result competition in the space has been high as market participants, both alternative and traditional, fight for business in a seemingly shrinking market. JLT Re explains that up until the middle of 2015 the inflow of alternative reinsurance capital was expected to continue flooding the reinsurance space unabated, but signs began to emerge that a slow down of its entry was evident in response to an overcapitalised sector and declining rates. The moderated, albeit continued entry of alternative reinsurance capital was noted by industry analysts and observers, with some suggesting that this was a healthy response to broader reinsurance market conditions, a sign of discipline and maturity in the insurance-linked securities (ILS) space. During 2015, explains JLT Re in a new report on pricing in the reinsurance space, the inflow of ILS capital led some in the space to estimate that by 2020 it would account for 40% of the global property catastrophe limit. “Whilst JLT Re certainly believes that alternative capital will continue to grow as a percentage of total outstanding limit, we anticipate that the rate of growth is likely to be less than these estimates,” said JLT Re. 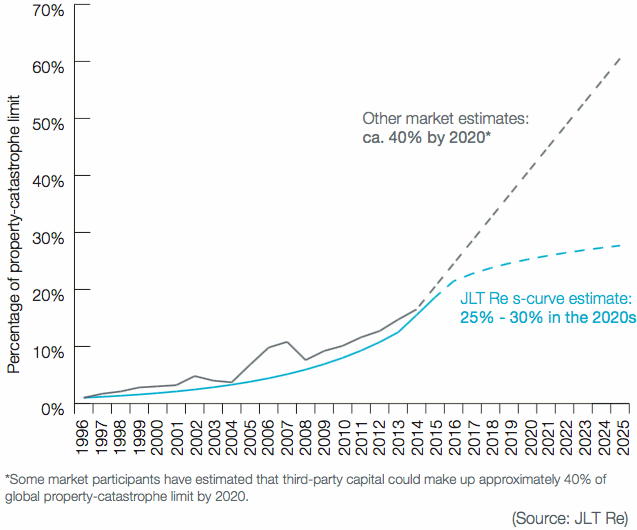 As the above chart highlights, JLT Re expects that by 2020 third-party reinsurance capital will account for between 25% and 30% of global property catastrophe limit, increasing at a steady rate through to 2025 that is far more moderated than the last five years. “As yields on catastrophe bonds stabilise at around 5% or 6% with uncorrelated expected losses of around 3%, it is likely that the entry of alternative capital into the sector will resemble and s-curve,” said JLT Re. As noted by JLT Re and evidenced in the Artemis Deal Directory, catastrophe bond issuance in 2015 did subside from the previous year, although 2014 was a record-breaking year that also included the $1.5 billion Everglades Re Ltd. (Series 2014-1) deal, the largest ever cat bond in the history of the market. The multi-year nature of certain catastrophe bonds means that these deals aren’t renewed on an annual basis, so when a substantial deal like Everglades comes to market it has the potential to greatly increase issuance for that year. What’s more, catastrophe bond issuance in the first-quarter of 2016 was the highest of any Q1 in the market’s history, so despite a retraction in issuance during 2015 investor and sponsor appetite for ILS remains, it’s just perhaps more disciplined and mature and understanding of the broader re/insurance and ILS market dynamics. “Furthermore, third-party capital as a percentage of property-catastrophe limit stands at roughly 19%, which represents an important but still marginal increase on previous years,” said JLT Re. With rates in the property catastrophe space remaining under significant pressure as competition remains and capacity continues to flood the sector, it’s not too surprising that ILS capital’s entry into this area of the market has slowed in more recent times. However, it’s also expected that ILS capital and features will increasingly find its way into other, potentially more attractive business lines, such as casualty, meaning that although its share of the property catastrophe space might be moderating somewhat, it has the potential to claim a larger and larger share of the overall reinsurance market limit.